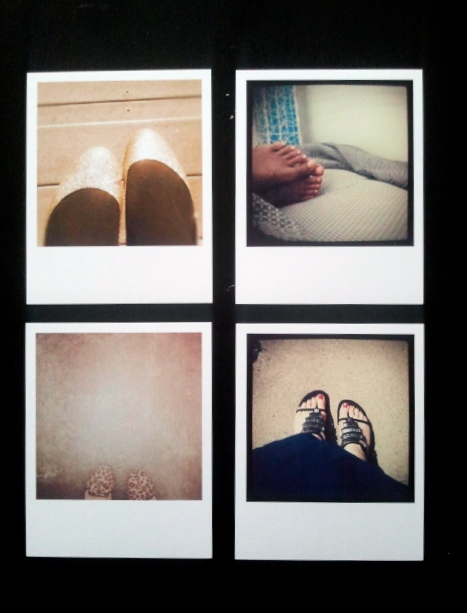 amelia pontes: ...you'll love your feet. I used to hide them beneath socks and Adidas Shelltoes even on the hottest of days in the New England summer where the humidity made sweat drip down the middle of your back. Size 10's and too wide to fit into strappy sandals, I deemed my feet too ugly for public consumption. With a big toe and little piglets standing by its side; they were too fat, too white, and too scary. They finally came out to play around the same time that I stopped wearing a thick t-shirt underneath my basketball jersey. If my fat arms could be seen in public, so could my toes. In high school, they televised our basketball games on local access television. During my freshman year, I avoided watching myself. In the sea of lanky white bodies, my yellow skin, dark bushy hair with matching eyebrows and shorts riding up my crotch felt like I was watching National Geographic and I was a one woman stampede. Even if I felt good about my body in real life and in real time, there was something that made me very uncomfortable to see it on a tv screen. There has always been this sense of acceptance that let me know that my body was good enough to be used in a public space. I didn't mind running down the street or riding my bike around the block. Yet, there was always something unnerving about my body being on display as a sign of beauty or attraction. When I chose to become a blogger, it was for the sole purpose of sharing my story (read: long ramblings about important moments in my past). However, in an image conscious society, in that, we love pictures of people doing even the simplest of things (i.e. the phenomena of instagram), folks weren't interested in only words. Writing wasn't enough. If I was writing about eating oatmeal and blueberries, I had to attach a picture of myself eating the goop. And then the comments were usually about what I looked like (I love your hair! So cute!). Through my body's work (awkward picture poses AND shooting bricks), I have found that there is a place for my physical self as more than just a vehicle towards something. My body, in itself, has the unearned right to exist. In my second year of high school and varsity basketball, I stopped caring so much about what I looked like when playing basketball and redirected my energy in comfort. Wearing sandals did not come from the yearning to be pretty or fashionable, but realizing that no one cared what your toes looked like after two hours of running. Your toes were supposed to be ugly. At that time, I thought I had earned the right to spread out my stinky toes in a pair of Nike flip-flops. More than ten years later, I'm sitting on my couch with my feet pressed against my thighs, still too fat, too white, and too wide, and think about how much I have come to love them. I love the way they hurt after a long day of walking. I love the way they callus. I love that they look like Fred Flintsone feet. My feet exist. They still aren't beautiful to me, but their purpose is functionality. Yet, I still can't believe that I have to come a place where I can take a picture of my toes and post them in a public forum. My feet have the right to just be and that is something that I love and cherish more than anything. I used to hate my feet too! In fact an ex-boyfriend made fun of them and caused me to hate them even more. I have my moms toes- which consist of a little bird claw toe for my tiny toe! its the ugliest thing ever! Now i've lost my mom, i look at my feet and i smile! I have and am a part of her! These are her toes! A part of her lives on in me... Thanks to this brilliant post on Mothers Day ill paint my horrible toes with my moms signature red nail polish and put that on Instagram! Now i always keep my toes nails painted, try to scrub them on a regular basis and just look after them better. I also own loads of peep toes. They may not look good, but they work good!